What makes a good brandy? No really, I’m clueless and I’d like to know. 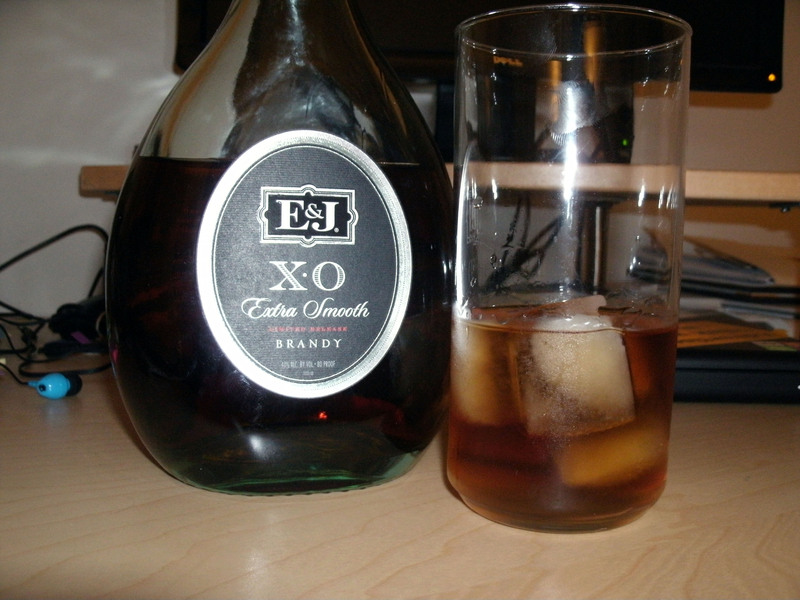 Thanks to BzzAgent, I’m at least on the road to getting to know it though, because thanks to them I was able to pick up a discounted bottle of E&J XO brandy. I did my research before going to pick up a bottle, and after reading some reviews and looking at the price I kind of figured that I was in for a rough ride. Lucky for me I’m completely uneducated when it comes to brandy, and I really think that helped my cause here because I actually found the stuff to be pretty good. When mixed, at least. To start the tasting, I first tried it on the rocks to see what the stuff was like by itself. I gave it a sniff first, and was pleasantly surprised. Yes, it did sting the nostrils a bit, but there was also a very sweet background to that. Like a caramel/toffee candy that had been left in the sun and begun to melt. I actually found it quite nice. As for the taste, that’s where it got a bit rough for me as a non-liquor drinker. Initially it did burn, but then it turned cloyingly sweet. I wish that flavor had stuck around but, alas, it was just a tease as the alcohol returned. The after taste was to watered down rubbing alcohol that had a spoonful of sugar poured into it to sweeten it up a bit. It wasn’t a super harsh burn, but the alcohol taste was still there as a constant reminder. After experiencing the full flavor of E&J XO brandy by itself, I then took to the recipe book they sent with the vouchers to see what I could do to make it a bit more palatable. 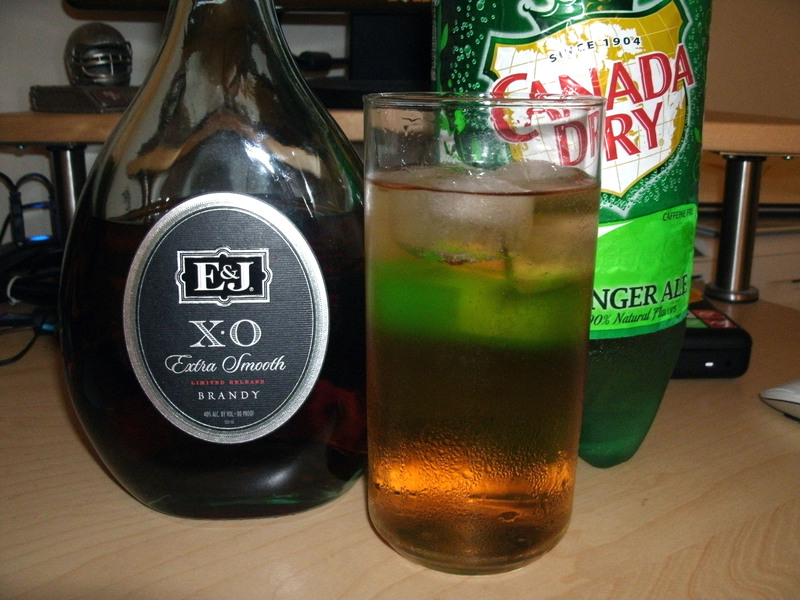 I didn’t have much to work with in my refrigerator, so I went with a ginger ale and brandy mix. And you know what? I really enjoyed it. The ginger ale hid the burn of the alcohol very well, but allowed the sweetness of the brandy to really shine. It leveled everything about the brandy out, letting the best flavors come through. I could easily sip on that though out an evening. Overall, it wasn’t nearly as bad of an experience as I was expecting with only my college memories of liquor to prepare me. I don’t know if I’d drink it again as a standalone beverage, but when used with a mixer I thoroughly enjoyed it. I don’t know if I’ll completely rethink my beer only mantra, but I can see this working itself into the mix every now and then. When it comes time to stock the bar, this is definitely the brandy I’ll go with – very reasonably priced, and you get a pretty good drink for your money. What’s your go to nonbeer drink? And if you’ve got suggestions on how to expand my spirit palate from here, let me know! 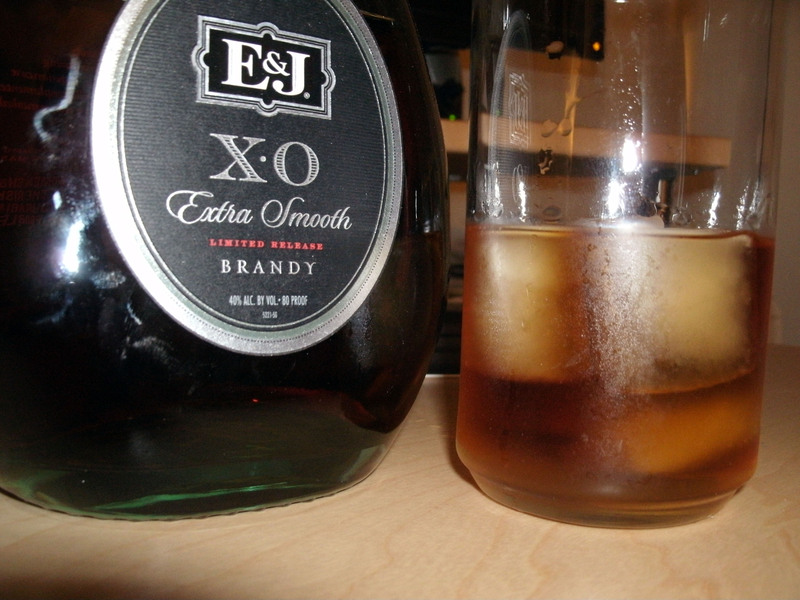 As a CYA disclaimer, I purchased E&J XO brandy at a discounted rate through BzzAgent. This entry was posted on July 22, 2013 by dasalehaus in Three Beers Deep and tagged brandy, cocktails, e&j, off topic, review, xo brandy.